It’s probably fair to say that I’m a bit of a science nerd. In fact, it’s a little more than that. I think that science is essential to how we develop as a species. It is an ongoing search for truth and understanding. It is how we rise above our own parochial views and engage with the bigger picture of the world around us. So when science comes under attack, I’m not going to just stand idly by. 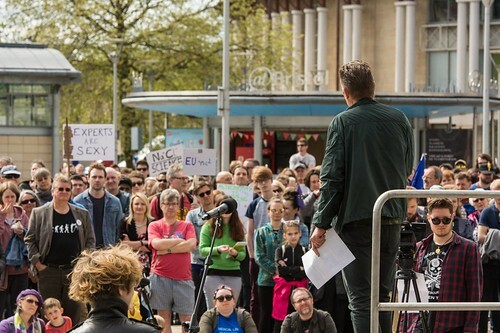 Which goes some way to explaining how I found myself recently in the centre of Bristol for the city’s science march, one of a global network of marches and science-based activities protesting against the increasing politicisation of science and the rise of nuckle-headed ‘alternative facts’ and general bigotry in the place of open and informed debate. I also wasn’t there just to tag along. 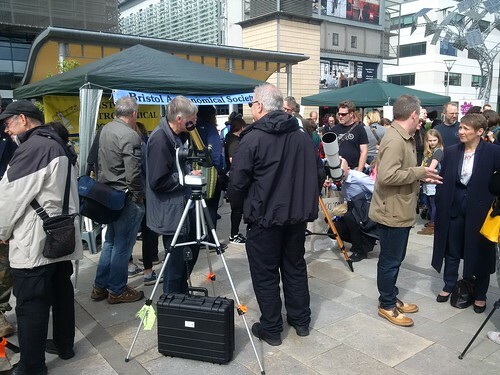 I’d brought with me some of my fellow astronomers, with the aim of taking this opportunity to share with the good people of Bristol some of the wonders of our nearest star, i.e. the sun. 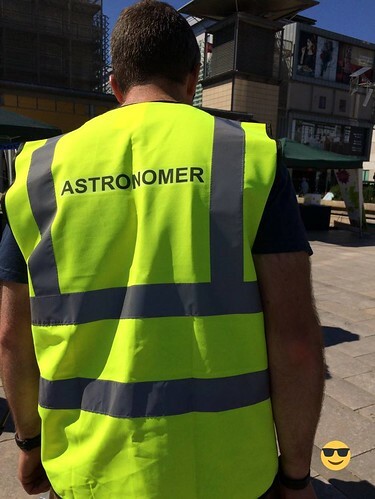 Because, to be honest, doing astronomy during the daytime does kinda limit your options. We all know that it’s important not to look at the sun with the naked eye or with ‘regular’ binoculars or telescopes. (If you didn’t, then you do now.) But there are several ways of observing the sun safely. So we’d brought with us two ‘hydrogen alpha’ solar telescopes, which let through only a small amount of the sun’s light at one particular wavelength. You can see one of them in the photo below – it’s the little gold thing on the tripod. This gives a very red image, as the light that gets through the filter is at the red end of the spectrum. 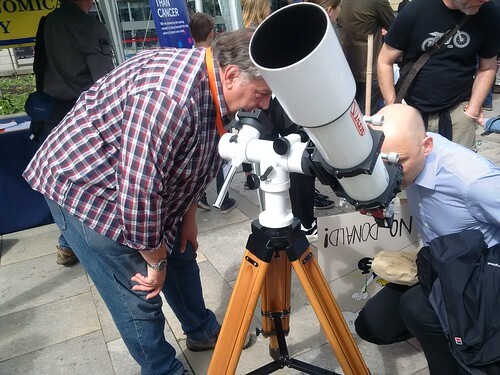 My friend John had brought along his refractor telescope, which was fitted out with a special filter (a ‘Herschel wedge’, in case you’re interested) which lets though a very small proportion of the sun’s light at all wavelengths. So you get a white-ish image, which is much more like we actually see the sun, but significantly less bright. We also had a solar projector, which projects an image of the sun onto a piece of paper so that you can look at it without having to stare through a telescope eyepiece. 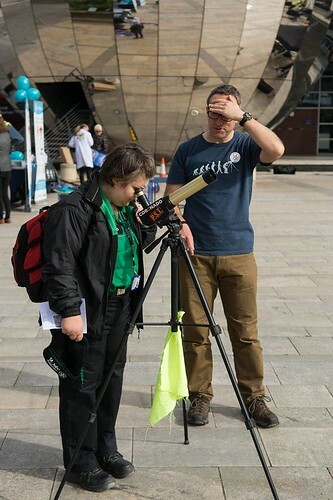 I forgot to take a photo of that, though, so here’s one of me showing the sun to a St. John Ambulance volunteer through one of the ‘hydrogen alpha’ scopes. 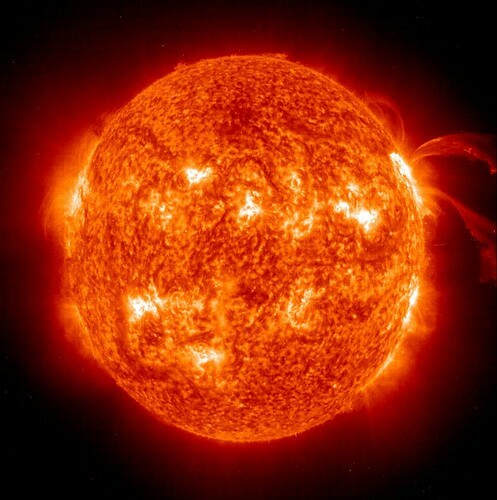 And here’s the sun itself. This is an image from the Solar Heliospheric Observatory (SOHO) in space, but it’s from the right day and shows the small sunspots that we were able to see with our telescopes. The sunspots are the little black dots on the disc of the sun. They are areas where the surface of the sun is much cooler than the bits surrounding it, due to violent activity on the surface. And they’re not actually that small, either. Each of the ones in the image below is almost the size of the Earth. Here’s the sun when it’s at a more active stage of its cycle, this time at x-ray wavelengths. That’s more like it. In addition to the observing, I also took part in the march itself. It was just a couple of miles around the centre of Bristol, up past City Hall to the University and then back down again. But is was definitely one of the politest marches I’ve ever seen, with people stopping every few paces to explain to passers-by what was going on and pausing to allow people and traffic to pass. At one point, someone on the other side of the street yelled “nerds!” and a massive cheer went up among this tide of scientists and associated hangers-on. 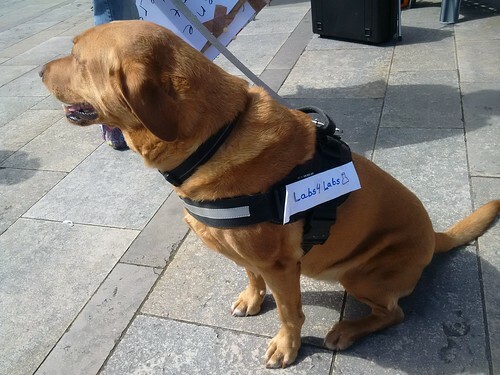 Talking of hangers-on, Molly (temporarily redesignated the ‘science lab’) was keen to come along to show her support. She’d even somehow managed to score her own small banner. And she was by far one of the most photographed marchers! And it was a great day. I really enjoy getting out to talk to people about astronomy, and doing so with an audience that was as enthusiastic about science as this one was a particular pleasure. And I think we managed to convert a few passers-by, too. It was also fantastic to see what scientists and science-based organisations can do when they come together. It was the first time I’d got involved in anything like this, but I suspect it won’t be the last. Because we have a fight on our hands. And I fear that what we’ve seen so far is just the beginning. We all need to stand up – and sometimes even march – for science. 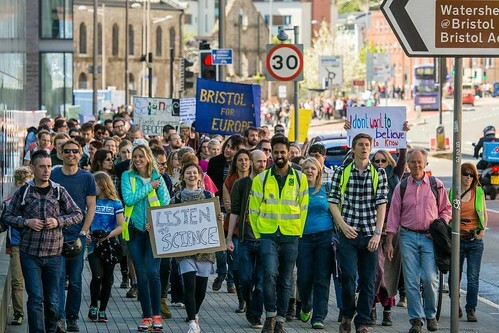 This entry was posted in Astronomy, Politics, Science and tagged Astronomy, Bristol, Science, Science March by Simon Perks. Bookmark the permalink.